Our favourite craft blogger Brittany Jepsen of The House That Lars Built is gifting us with a series of three very festive posts! 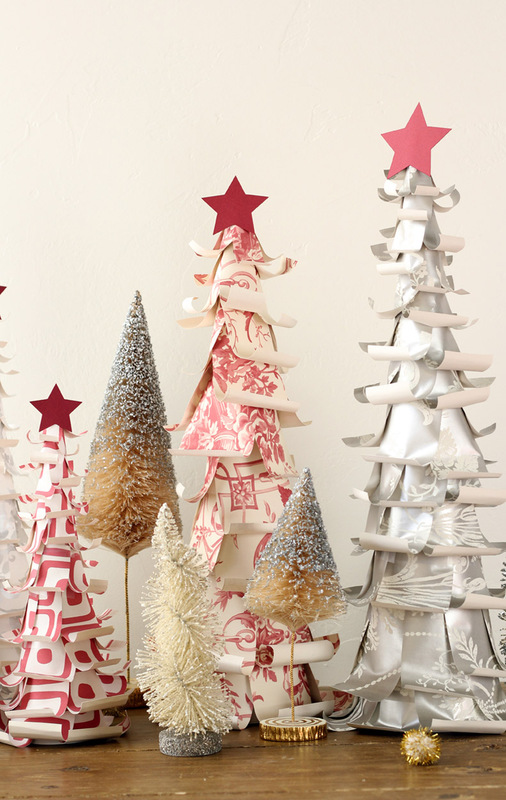 First, Brittany decks the halls with these delightful DIY wallpaper Christmas trees. 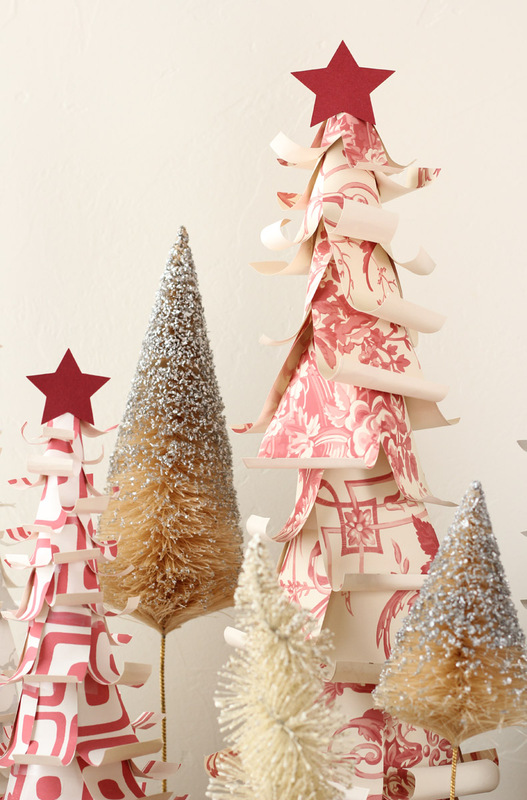 There’s nothing quite like decorating for the holidays! In my opinion, there are very few things more fun and fulfilling than knowing you prepared the decorations yourself! 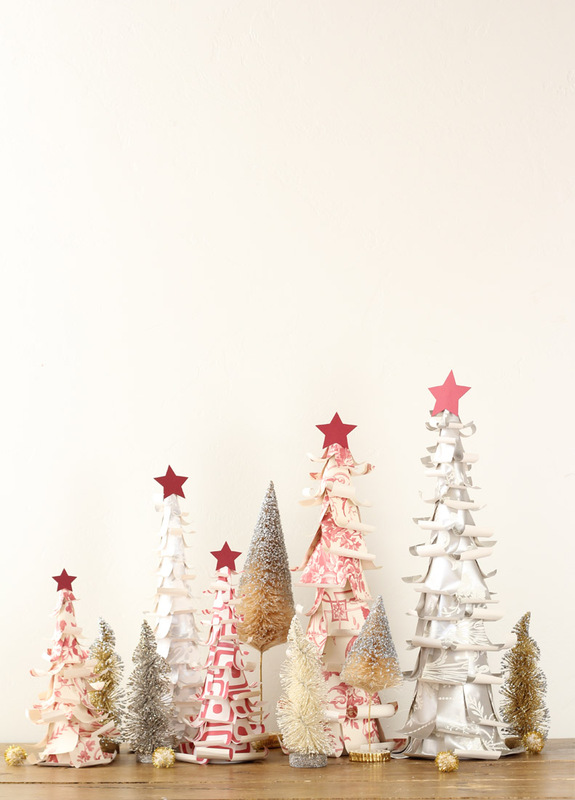 These Christmas trees were great fun to create and they look so lovely perched on a mantle or centerpiece. 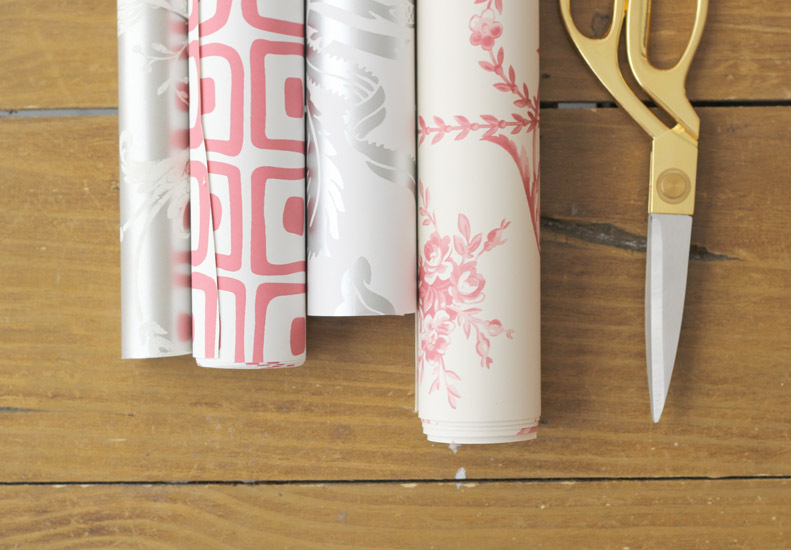 They’re perfectly created from leftover wallpaper and look best when massed with a few other patterns and sizes. I chose to use Laura Ashley Josette Pewter, Pelham Cranberry, Tatton Silver, and Tuileries Cranberry wallpapers. Materials: Laura Ashley wallpaper, white poster board, scissors, clear tape, a pencil, and hot glue. Take your poster board and draw a semi-circle from one edge of the paper to the next. Cut out the semi-circle. Your poster board should have one curved side. The curved side will be the base of your cone. Take the corners of the poster and curve one corner underneath the other corner. Keep rolling the corner in until you form the point of the cone and achieve the desired size. Once you’re satisfied with your cone, tape the top corner to keep the cone from unraveling. **Note: You may need to adjust the base if the cone does not stand up straight. 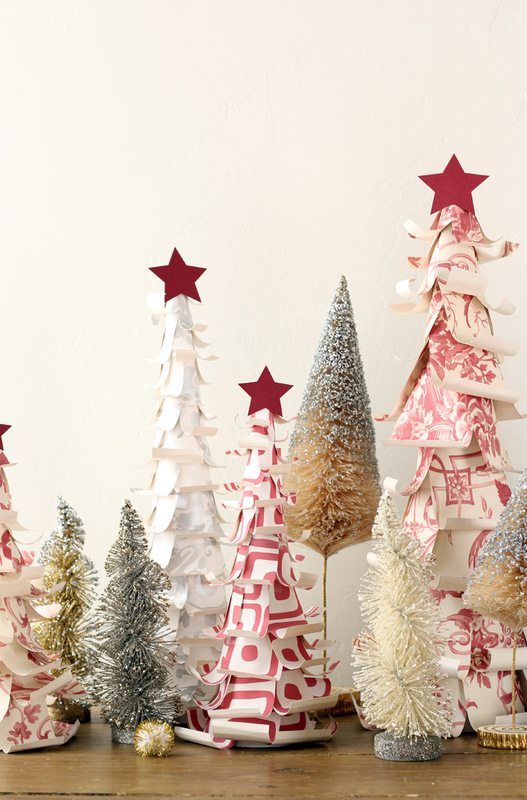 Cut your paper into ½ inch strips, long-ways. Cut your strips into smaller rectangular strips about 2 inches long, short-ways. You may need to cut bigger or smaller strips depending on the size of your cone. Also, the point of your cone will need smaller strips than the strips used for the base. Curl the ends of the strips that will be facing outwards. This will give your cone the texture of a Christmas tree. Start at the base of the cone. 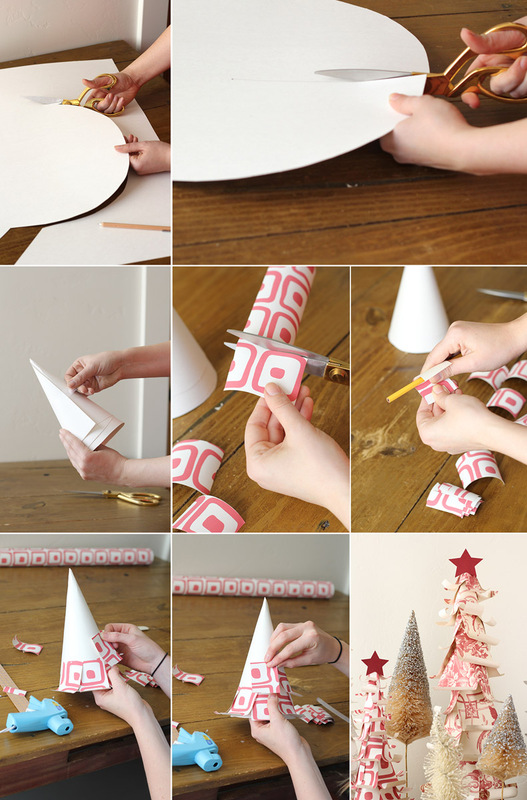 Tape the non-curled end of your strips to the cone one by one. Make sure to overlap the strips a little bit to make sure the cone doesn’t show through. Work your way around the base until you land where you started. Start the next row a little higher than the last. Again, make sure to overlap a little to hide the tape. Continue to cover your cone with the strips until the cone is covered. Finish the top off with a star. Use the hot glue to adhere the star. A special thank you to Brittany from The House That Lars Built for this fun and festive craft! 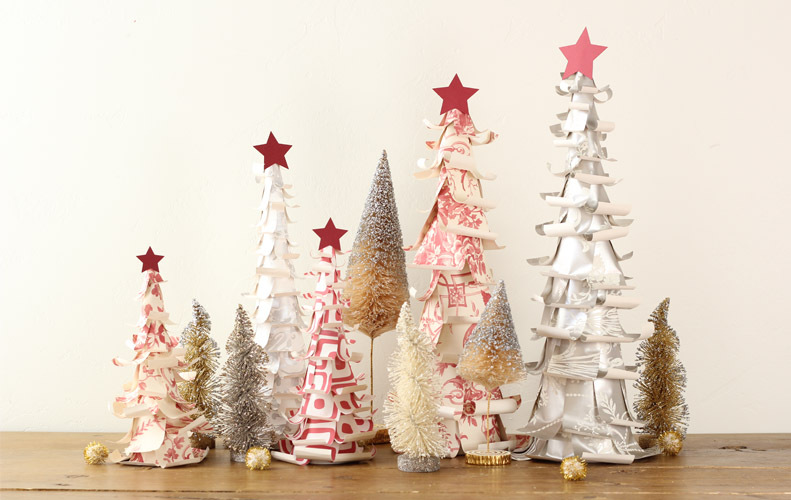 Where in your home will you place these lovely wallpaper Christmas trees? Not feeling crafty? 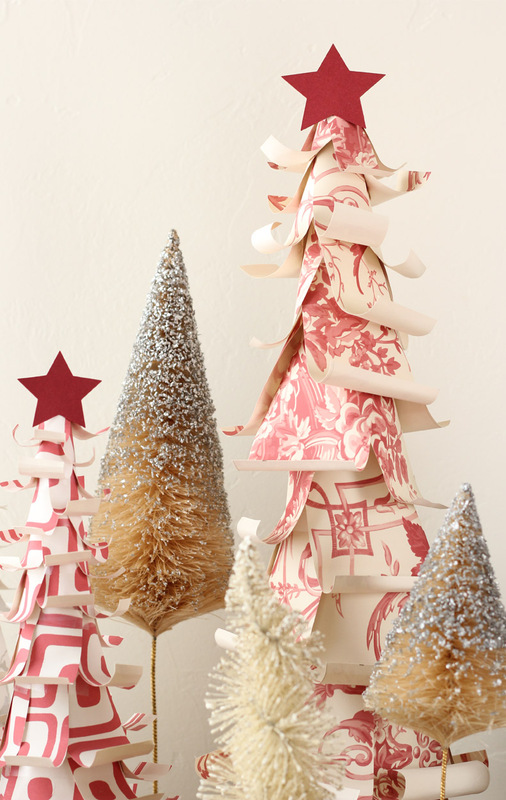 Visit our Holiday Shop to find the most darling decor! This entry was posted in Make & Do and tagged brittany jepsen, christmas, Christmas Tree, diy, festive, holiday shop, josette pewter, Make & Do: Wallpaper Christmas Trees, make and do, pelham cranberry wallpaper, tatton silver, the house that lars built, Tuileries Cranberry, wallpaper. Bookmark the permalink.